A water system is a modern convenience in your RV and familiarity with all the parts and inner workings can help identify any issues that crop up. One of the best comforts an RV has to offer is the convenience of free-flowing water for cooking, cleaning and bathing. The water system in your RV has similarities to a residential water supply in that the home can be part of a city water service line or be supplied by a well on the property. Firstly, an RV water system consists of a water storage tank constructed of polyethylene, a durable, lightweight and impact-resistant material. The average RV water storage tank has a capacity of about 40 gallons or about 150 litres. It may be installed to the exterior between the frame rails, or in the interior under dinettes, couches and beds. An important feature of an RV water tank is the vent line, which can cause a few problems if not operating properly. If the water fill hose is installed properly to the tank and there is kickback out the filler access when adding water, the vent may be clogged or kinked, which doesn’t allow air inside the tank to exit. The tank will actually swell and push the water back out, sending the misleading signal to the owner that the tank is full. The city water inlet allows the owner to utilize a park or resort water service to draw water from. The city water inlet may be positioned beside the water tank fill or elsewhere on the exterior of the RV. This assembly will have a back flow device which has a spring-operated O-ring assembly to prevent water loss when the onboard RV water pump is operating. There will usually be a screened washer installed to reduce dirt and debris from entering the water lines and plugging screened faucets, which should be cleaned or replaced, if required. There are a few work orders in spring at our shop describing leakage or spraying of water from the city water inlet when the water pump is turned on. This is usually caused by an owner forcefully pushing the plunger assembly inward while under pressure from the water pump and dislocating the O-ring during the winterizing procedure. A highly recommended addition to the city water inlet is a water pressure regulator, which is available in a basic 45 psi set unit, or you can upgrade to a regulator with a gauge, to monitor the incoming water pressure at a park or resort. In regards to filling the water tank or hooking it up to the city water inlet, you should always use an approved RV-specific water hose and not an ordinary rubber garden hose. The RV water hose is lead-free, safe for drinking water and available as a kink-, twist- and tangle-resistant product. The RV water pump will be powered by the 12-volt DC system and will most often be found in close proximity to the water storage tank. The two most common manufacturers are SHURflo and Flojet; these are both very reliable and durable units. They are available in many different models with some offering improved gallons-per-minute (GPM) flow or decreased noise levels. An RV water pump can be an excellent indicator of a water leak in your RV. If the pump cycles on and off in short bursts frequently with all the faucets closed, you should be concerned and start opening cupboard doors, drawers and other access panels to check all water fittings and piping. Don’t forget to check the pressure relief valve at the water heater; it can weep slightly if there is not a proper air space at the top of the tank. If your pump is excessively noisy, you have some options available to allow the pump to operate quietly. There is a hose kit available to create a soft line connection to pump at the water tank and the main line or you can purchase an accumulator tank which will minimize water system pulsation and on/off cycling at low level water flow. 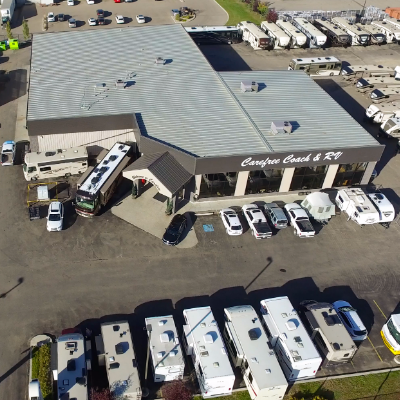 Both SHURflo and Flojet have these units to offer at your local RV parts store. Frequently check the inline filter on your water pump to ensure it is clean and debris-free for improved water flow. Many full-time RV folks will add water filters to their RV for improved water quality. These units can be installed temporarily to the outside city water inlet—either permanently to the city water feed line or as a designated water faucet at the kitchen sink. Both will reduce sediment, chlorine, unpleasant taste and odours. You can even purchase a digital water purity tester if you’re concerned or curious about the water quality where you’re parked. To further enhance water quality you can purchase a water softener that in some cases will use common table salt to produce softer water characteristics. This prevents scale build-up and rust stains and increases the life of components like the water heater, dishwasher, clothes washer and ice makers. In the next article we’ll further discuss tasks like proper sanitizing of the water system, checking anode rods and removing odours from hot water tanks. There will always be folks who enjoy the thrill of the open road, but the recent economic climate has changed the RV lifestyle nationwide.